Senior club appearances and goals counted for the domestic league only and correct as of 22:42, 30 April 2017 (UTC). Kevin Molino ਦੇ ਨਾਲ ਕਾਕਾ2015. ↑ "Kaka". National football team. Retrieved 8 April 2014. ↑ Paulo Torres (12 December 2015). "Bola de Ouro (Placar Magazine)". RSSSF. Retrieved 13 January 2016. ↑ Paulo Torres (12 December 2015). "Bola de Prata (Placar Magazine)". RSSSF. Retrieved 13 January 2016. ↑ "Kaká". Goal.com. Retrieved 13 January 2016. ↑ 9.0 9.1 "Italy – Footballer of the Year". RSSSF. Archived from the original on 21 January 2015. Retrieved 6 February 2015. 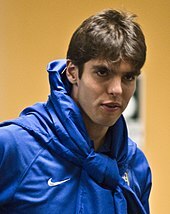 ↑ 12.0 12.1 12.2 12.3 "Kaká – UEFA.com Profile". UEFA.com. Retrieved 13 January 2016. ↑ "Statistics — Tournament phase — Assists (2005–06)". UEFA.COM. Retrieved 21 May 2015. ↑ "FIFPro World XI 2005/2006". FIFPro. 20 December 2013. Retrieved 9 June 2015. ↑ "FIFPro World XI 2006/2007". FIFPro. 20 December 2013. Retrieved 9 June 2015. ↑ "FIFPRO WORLD XI 2007/2008". FIFPro.org. Retrieved 13 January 2016. ↑ "Statistics — Tournament phase — Assists (2006–07)". UEFA.COM. Retrieved 21 May 2015. ↑ José Luis Pierrend (6 March 2012). ""Onze Mondial" Awards: Onze de Onze 1976–2011". RSSSF. Retrieved 14 September 2015. 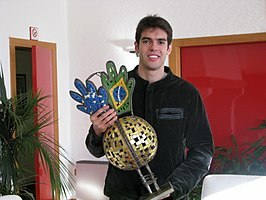 ↑ 28.0 28.1 "Kaká – FIFA Profile". FIFA.com. Retrieved 13 January 2016. ↑ "2007 FIFA Club World Cup awards". Fédération Internationale de Football Association. Retrieved 5 March 2013. ↑ Arielle Castillo (30 July 2015). "All-Star: The post-game celebration turned into a love fest for 2015 MVP Kaká". MLSsoccer.com. Retrieved 26 October 2015.